Champion Logistics Group specializes in providing value added transportation and warehousing services to the Production and Events industry. We have a dedicated team of professionals working exclusively on the coordination and production of special events. Champion’s high-profile projects include the Chicago Marathon, The Masters, numerous NFL Super Bowl and Draft events, American Red Cross relief, Red Bull entertainment events, The US Open at Flushing Meadows and the Nike NFL rebrand. Champion uses air-ride trailers, equipped with e-track, load bars and ratcheting straps. Our drivers understand the value of being on time, every time and are trained to effectively negotiate marshalling yards and the crowded city streets in which events occur. Our drivers are tracked for on-time delivery to all major events. Champion will work directly with your onsite reps, project managers and technicians to ensure a successful set-up and strike. At larger events, Champion will have onsite representation to effectively manage the entire process. Champion has been a trusted partner in the Production and Events industry for years. We can share our project successes and references with you. 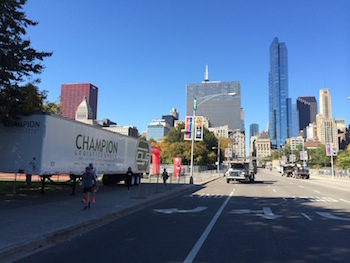 By using the Champion fleet and a network of specialized event carriers, Champion provides the most reliable and flexible transportation services in the industry. Our staff is available 24/7 to handle any situation that may arise. Champion has the resources to ensure these events are completed cost-effectively and on schedule. Having an accountable, on-time, logistics provider is invaluable when successfully planning a large project or event. Champion also offers an experienced Air Freight division to handle those last minute changes or additions to an event. Call Champion today at 800-323-5401 to discuss.